Choosing a dog couch depends on many factors. Do you want something that enhances your home’s decor? Is it easy to clean? Does it have memory foam to protect your pup’s sore joints? Whatever you’re looking for in a dog sofa, you’ll find it here. Hopefully, this article will assist you in determining the best dog couch for your pooch. 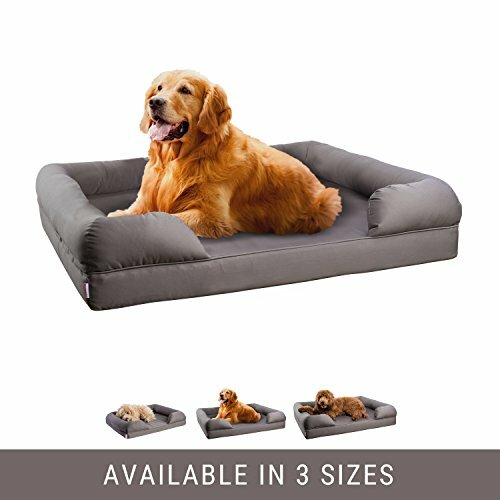 Why Should I Purchase a Dog Sofa? Pet furniture is not just designed to provide a cozy place for your dog to snooze. There are many reasons why pet owners choose dog furniture. The Enchanted Home Pet Dreamcatcher Dog Bed is an elegant, large, wonderfully designed dog couch that works for small to medium sized dogs. The cushion cover is totally removable and machine washable, which makes it very easy to keep clean. It’s recommended that excessive pet hair is removed before putting it through a wash cycle though. The bed is elevated, which prevents drafts. The cushion is a full loft design. Dogs who use it are totally engulfed in comfort and warmth. The space under the couch can be used to store pet toys. The pillow it comes with is very firm. However, the cover unzips so you can remove it and replace it with any standard size pillow. Though it comes with an elastic tether to keep the cushion on, more active dogs can easily move the cushion. If your dog moves a lot in their sleep then this may not be the best option for your home. The elevated design can be challenging for older dogs or dogs with mobility issues. The 30-pound weight limit is likely fine for families with a single dog but with multiple dogs, you’d need a higher weight limit. 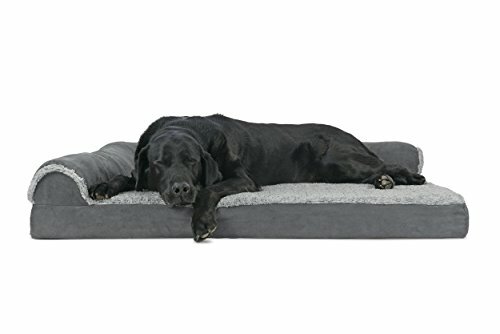 This memory foam orthopedic dog bed set from Fantasy Furniture is the perfect dog bed for many owners. For others, it’s a little lacking. It comes in three available sizes so pet owners can pick the perfect one for their dog. The small has a ten-pound weight limit, the medium has a 20-pound weight limit, and the large has a 40-pound weight limit. The cushion is made from orthopedic memory foam, which is perfect for older dogs or dogs with joint or bone pain. The cushion zips off for easy cleaning and is stain resistant. The high-quality microsuede is a sleek addition to a bedroom or living room. The set comes with pillows, a toy, and a matching mat. It comes in seven different styles with a variety of colors and patterns. The only thing holding up the center of this dog bed is a single bar. For heavier dogs, they can easily sag on it and it can be uncomfortable. Some owners have added a board to the bottom but at this price point, not extra work should be required. The ends are covered only in cloth. Without padding, they’re not particularly comfortable for dogs to rest their heads on. The manufacturer seems to overestimate the size of dog that can comfortably fit on this bed. The Brinkmann Faux Leather Sofa Bed is an excellent option that falls between a sofa and bed. With plenty of room for a dog to stretch out, plus the look of a couch, it may be the perfect option for many owners. At 29 inches by 19 inches, it’s large enough for small or medium-sized dogs not just to lie down but to spread out. The polyester fiberfill includes cedar shavings. This helps absorb odors and create a wonderful scent for both humans and dogs. The cover comes off and is totally machine washable. The part the dog sleeps on is made from curly fabric that’s cozy and comfortable. While the back and sides look like a couch, the part the dog sleeps on looks like a dog bed. This may not be the top choice for an owner who wants a classic couch look. Part of the arms hangs loosely. This doesn’t provide optimal support for a dog’s head. Some owners have reported that the inside cushions don’t quite fill out the cover, which leaves a lumpy look and feel. Of course, the best option depends on the size of the dog and their needs. For the best hybrid design, we suggest the Brinkman. For the cutest look, we recommend the Fantasy Furniture Deluxe Orthopedic Memory Foam Dog Bed Set that not only comes with accessories but in many different fabrics and styles. However, if your watching your bottom line then try the FurHaven Chaise Couch.